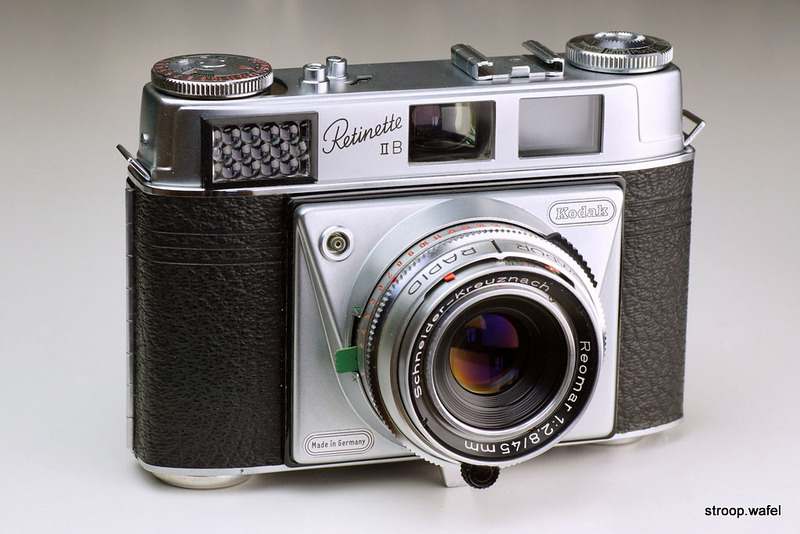 The Retinette cameras were more affordable versions of the Retina series. They had simpler lenses, generally three-element Schneider Reomars featuring front-cell focussing. The first four Retinettes were folding Retinettes, all following models were non-folding or rigid Retinettes. Most models were very popular and produced in large numbers, at least one million Retinettes were made. Their abundance makes them a common sight on the second-hand market and they are amongst the best value for money if one is looking for a camera to actually use. Only the French versions still demand high prices. The Retinette type 147 from 1939 was the first Retinette model and rather unusual as it is the only folding Retina or Retinette of which the door flips downwards instead of sideways. The trim is also unusual, in particular the corrugated top housing. Also the lens base is corrugated, this was only seen again in the Retina 167 and Retinette 160. The shutter was a very simple self-cocking AGC K-3-S with 3 speeds + B. All in all a very interesting start to the Retinette series. 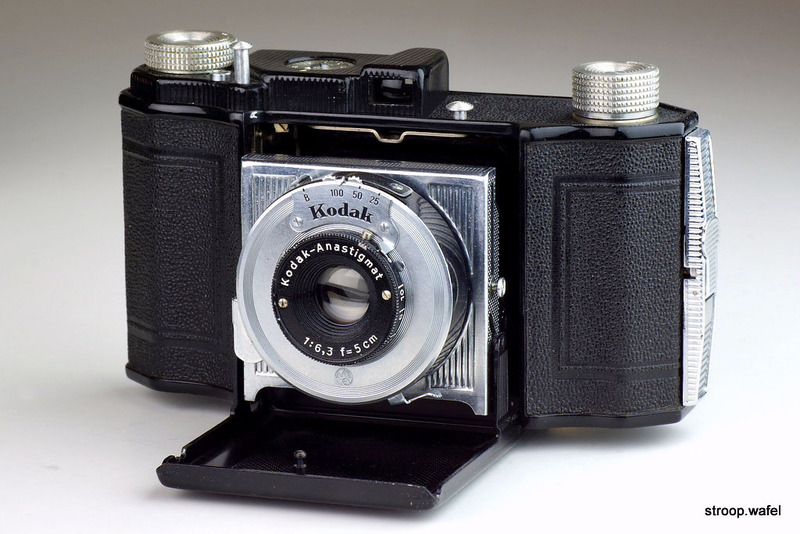 The first folding Retinette featuring a Kodak-Anastigmat 50 mm f/6.3 lens. 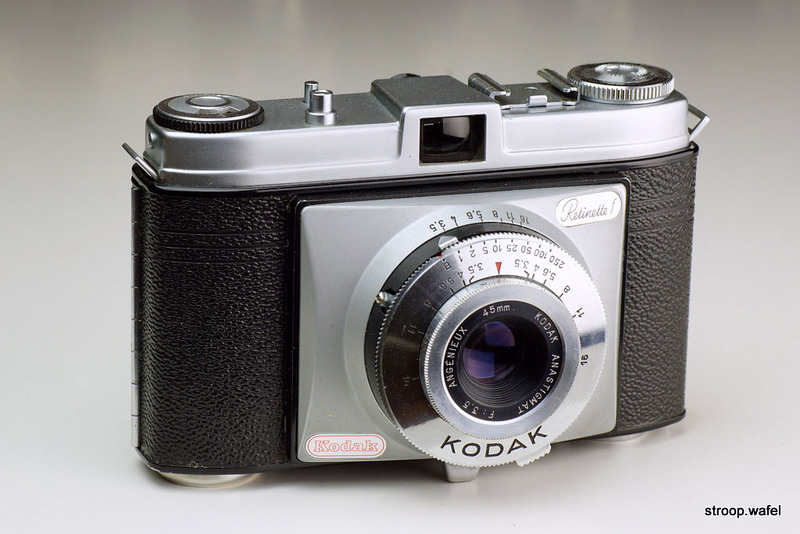 The Kodak Retinette II type 160 followed not long after and was a much more traditional looking model, similar to the Retina type 149 but with a black top housing. However, it did have front cell focusing, not helical focussing like the Retinas, and a distinct corrugated lens board. 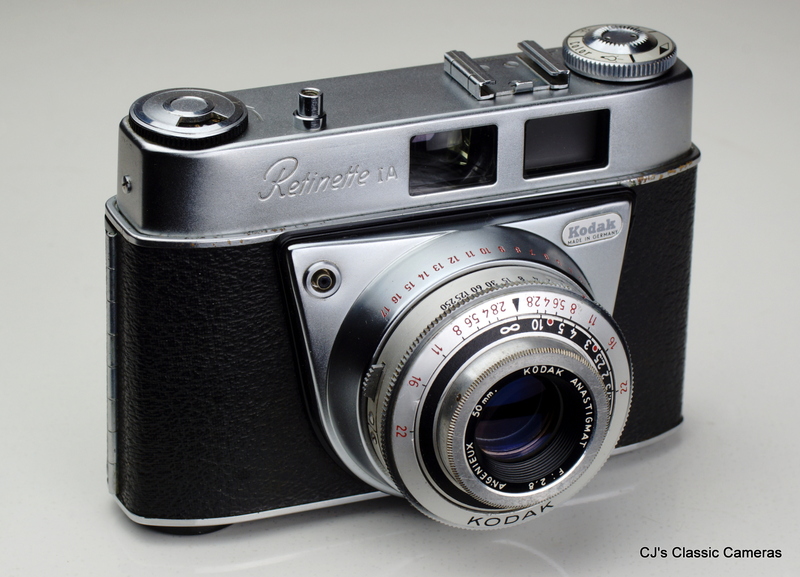 Compared to the Retinette 147 it had a much faster f/4.5 or f/3.5 lens and an improved AGC or Compur shutter. 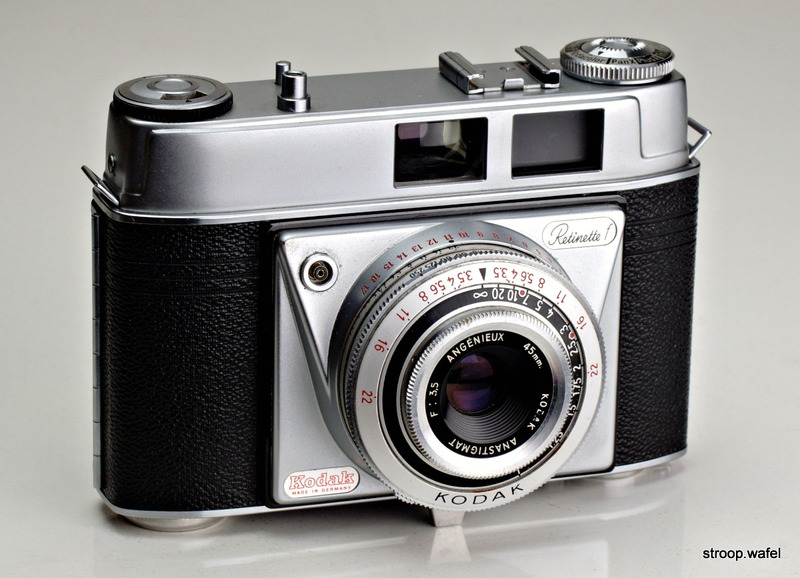 Similar shutter-lens combinations were available for the Retina 167, a wartime Retina camera very similar to this Retinette mode. 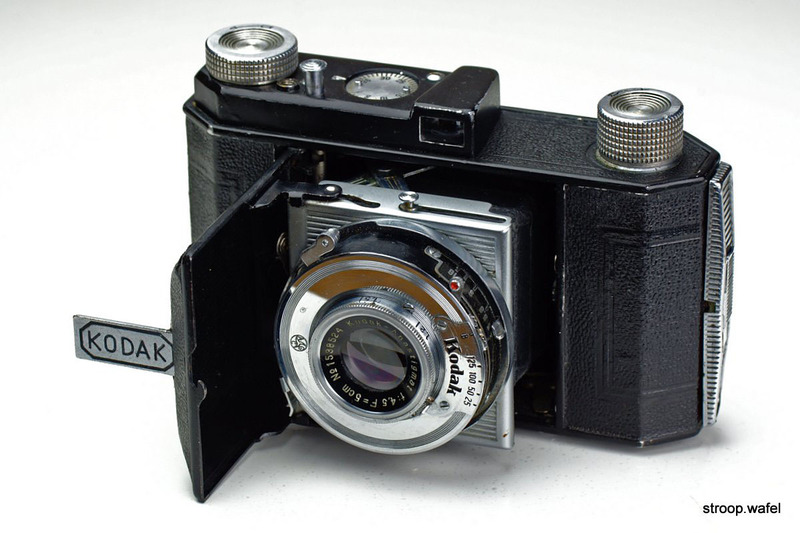 A folding Retinette II with Kodak-Anastigmat 50mm f/3.5 lens and Compur shutter. This is an early model with a split, two-piece top housing. Later models have a single top housing. A similar change occurred during production of the Retina I type 148. A different example, this one with slower Kodak-Anastigmat 50mm f/4.5 lens in AGC K-4-S shutter. This was a similar shutter as on the Retinette 147 but with 4 speeds, although the extra speed of 1/125s did not add much to the already present 1/100s. 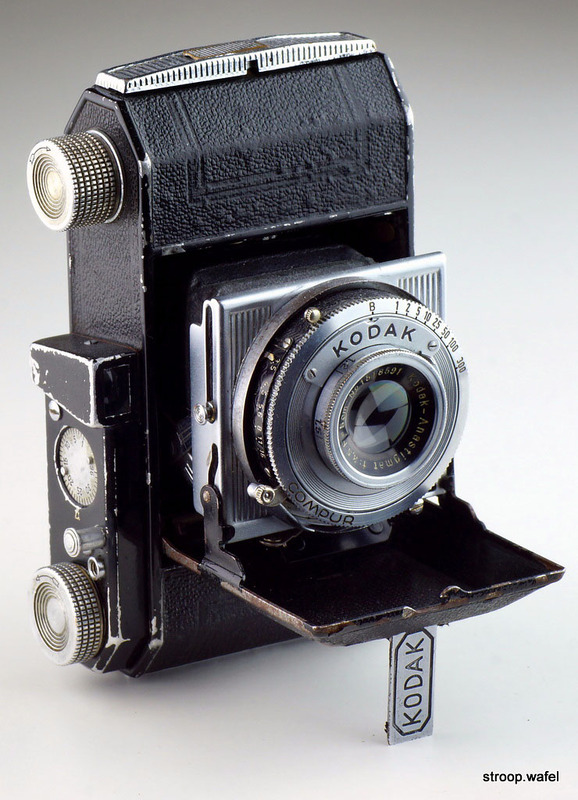 After the second world war Kodak cameras had model numbers starting with '0'. The first post-war Retinette was the type 012. This model looks even more like the Retina type 149 than the Retinette type 160 did. 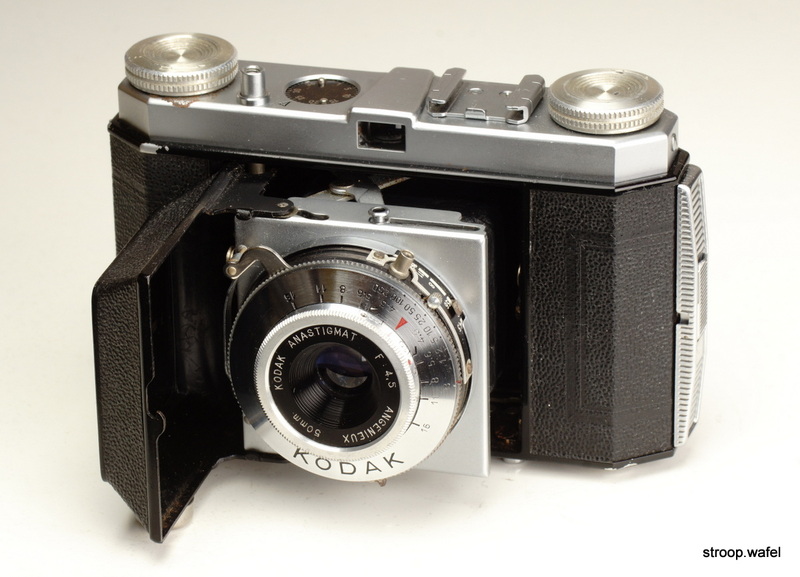 Initially it was sold with an Ennatar f/4.5 lens, the only Kodak camera ever to sport an Enna lens. 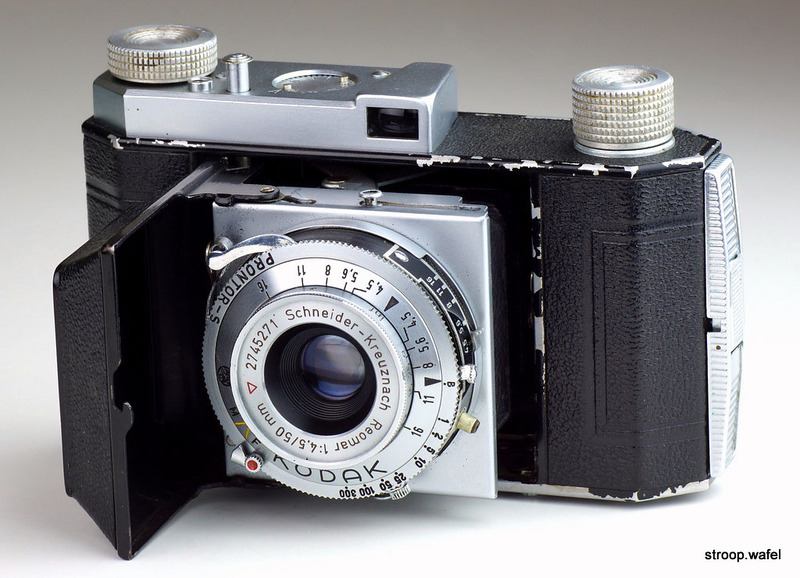 Later production featured a Schneider Reomar lens which can be found on nearly all post-war Retinettes, including the non-folding ones. There was also a French version with an Angenieux lens and a French-made shutter. 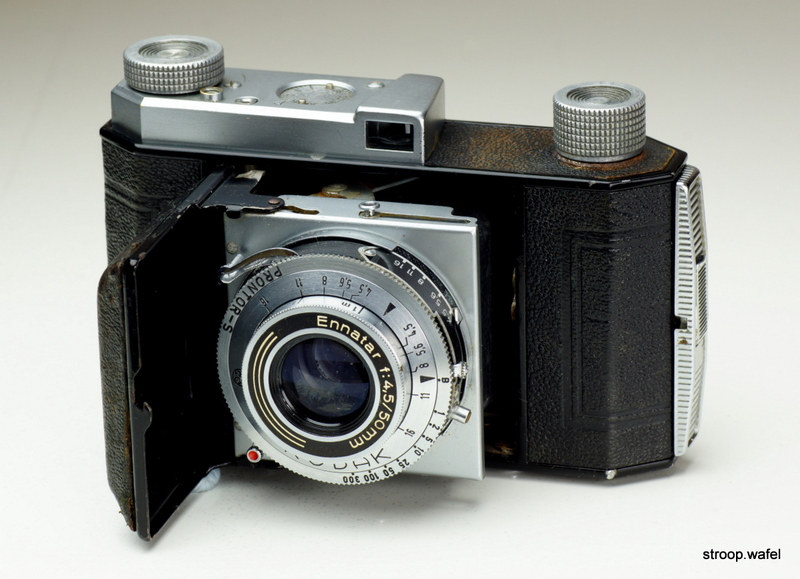 The first post-war folding Retinette type 012 with Reomar 50mm f/4.5 lens in a Prontor-S shutter. Unlike most later Reomars this lens had a serial number, which can be dated to around Sept 1951. A Retinette type 012 with Ennatar f/4.5 lens. I cannot find any info on why this lens was used, although some websites claim it was better than the Reomar. Presumably it just was the best option for a cheap lens until the Reomar came available. The Ennatar could also be found on some Wirgin Edinex cameras, but only very rarely. The last of the folding Retinettes was the Retinette type 017. 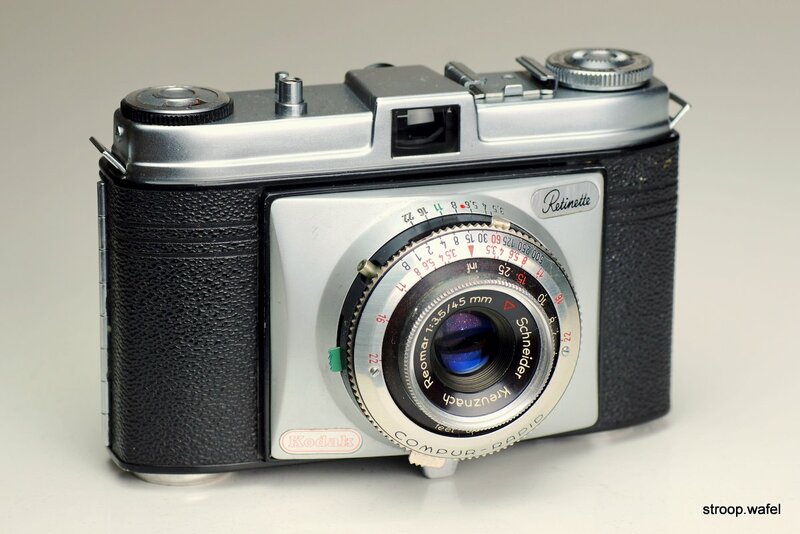 This model still had a wind knob, contemporary Retinas like the Retina Ia and Ib had wind levers. Visually this model is most similar to the Retina I type 013 but with a black frame counter. Specifications were nearly identical to the Retinette type 012. Also of this model a French version exists. The last folding Retinette type 017 with Reomar 50mm f/4.5 lens in a Prontor-SV shutter. The lens can be dated to around Nov 1952. Often when I get a second camera of a certain model, they end up being different due to small changes during production. It was no different here, when I got an Retinette 017 dating from about six months earlier than the one pictured above. The location of the body serial nr. was, rather unusually, stamped on the accessory shoe itself. The bottom plate had smaller 'feet'. The Retinette type 017 was also produced in a French version, which had a Angenieux 50mm f/3.5 lens, so faster than the Reomar f/4.5 on the standard version. The unmarked Atos shutter was made by ATOMS in France. The body was similar to the late version of the 017 (see above) although the serial number was not engraved in the top housing below the accessory shoe but indicated inside the back door instead. A few words about the shutter, as it was difficult to find information about it. ATOMS stands for 'Association de Techniciens en Optique et Mécanique Scientifique' which was based in Nice. 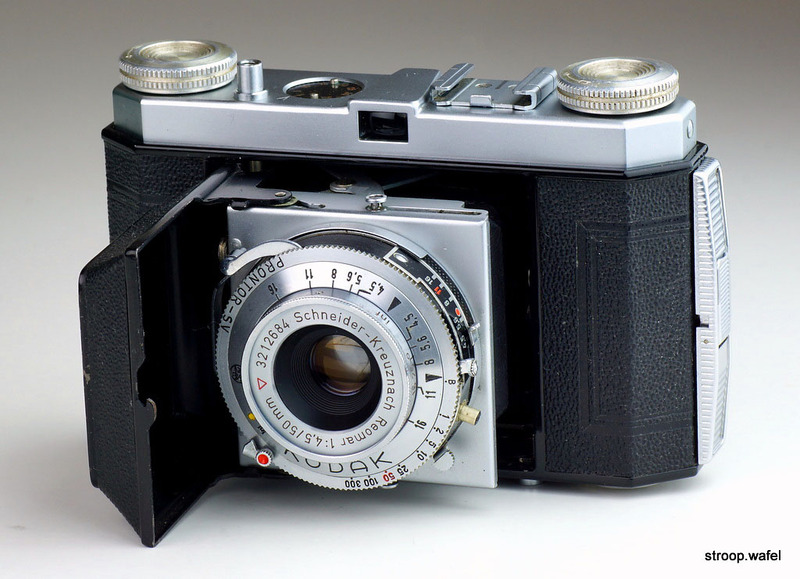 Starting in 1946 they build several (pseudo) TLR cameras, including the Aiglon and the Atoflex, but mostly produced leaf shutters for other French camera makers, including Lumiere and Foca. The shutters were internally similar to the Compur but had only two shutter blades. The Retinette series continued as non-folding cameras and thus their development diverged somewhat from the Retina series. 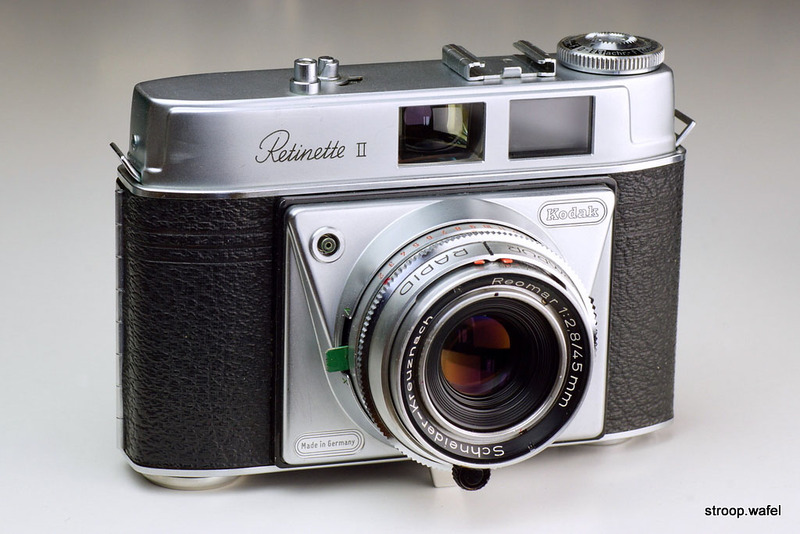 In contrast to the first non-folding Retina, the IIS type 024, which was soon to follow and had a new large top housing to accommodate the bright line rangefinder, the Retinette type 022 had the top housing from a folding Retina Ib type 018. The finish of this Retinette was not as high-quality as the earlier Retinettes, due partly to the dull-grey plastic lens base and cheap-looking plastic frame counter located where the wind knob used to be on the folding Retinettes. On the other hand, this was the first Retinette with a wind lever. A few changes occurred during production of the type 022. Early production had a flash socket on the shutter itself and a smaller lever to change the aperture setting. Later production had a flash socket integrated in the lens base and an aperture ring. A French version also existed, which is similar to early production Retinettes, but has a Kodak shutter with Angenieux lens. The Retinette type 022, the first of many non-folding Retinettes. The Reomar lenses on this and all following models, no longer had serial numbers. This early production example had a flash sync socket on the shutter itself. Later production example of the Retinette type 022, which is the version most commonly found. It had a flash sync socket integrated in the lens base as well as an aperture ring instead of a lever like on the early production models. The French version of the type 022, the Retinette f, with a ATOMS shutter and Angenieux lens. It had its flash socket mounted on the shutter and missed the VX lever. The next Retinette did not see the light until about four years later: the 1958 Retinette II. Presumably it was called Retinette II because it was the second non-folding model, just like the type 160 folding Retinette was called a Retinette II. 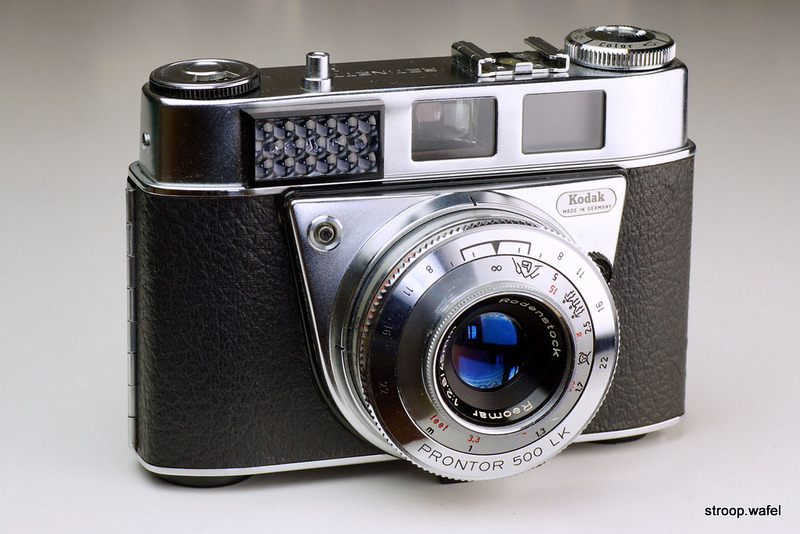 It featured a new large chrome top housing like contemporary Retinas and a bright line viewfinder, with one window projecting a frame in the viewfinder. The lens base also changed, it was sort of a hybrid version of the earlier square one and the later triangular ones. The frame counter was integrated in the top housing. This was the first Retinette with its name engraved in the top housing. Interesting features were the moving depth of field indicators when changing the exposure setting, first introduced on the Retina IIS. Another difference from previous Retinettes was the exposure setting. Instead of an aperture scale a light value scale is indicated. If one would turn the speed ring, the aperture would also change to keep the same light value. This was one of the rarer Retinettes, apparently only about 19,000 were produced compared to >100,000 of most other models. For some reason it is these days even harder to find than some of the Retinas with lower production numbers. The non-folding Retinette II, with fast Reomar 45mm f/2.8 lens and Compur Rapid shutter. Note the little red tabs, which are sliding depth of field indicators. It had no aperture scale but an LV (light value) scale instead. It is one of my favourite Retinettes. 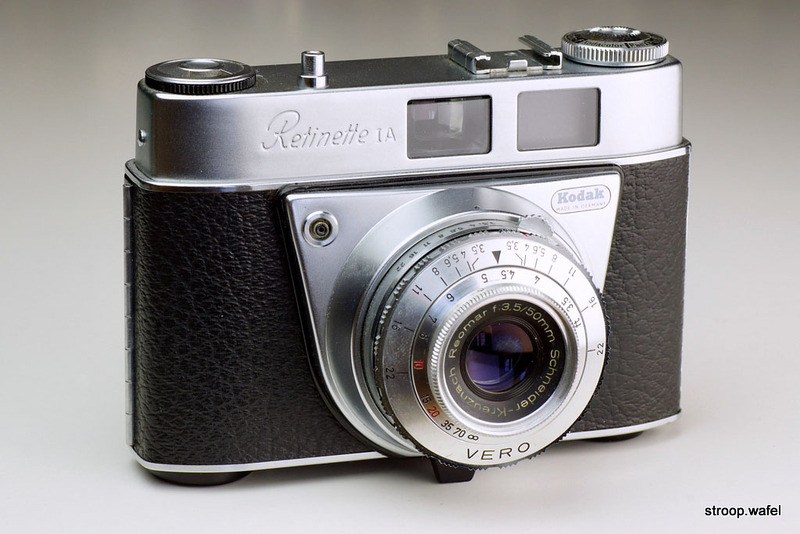 The next Retinette, the I type 030, was a slightly less advanced version - in many respects quite similar to the Retinette II but having a frame counter knob instead of the integrated version, a slower f/3.5 Reomar lens and a depth of field scale engraved on the shutter instead of the sliding tabs. It was produced around the same time and in much larger numbers than the Retinette II, perhaps because the latter was soon replaced by the IIB. A French version was also made. A peculiar version exists that appears to have been produced for the UK market only, the 030/9. It has the top housing of the Retinette type 022 but the lens and shutter housing of the type 030. It has the standard shutter speed and aperture settings. A Retinette I type 030, the last Retinette without its name engraved in the top housing. The UK version of the Retinette I type 030, which featured top housing of the earlier Retinette type 022. A french version of the Retinette I type 030 was also available, it was named 'Retinette f' (like the type 022 version) and sported a ATOMS shutter with Angenieux Anastigmat 45mmf/3.5 lens. 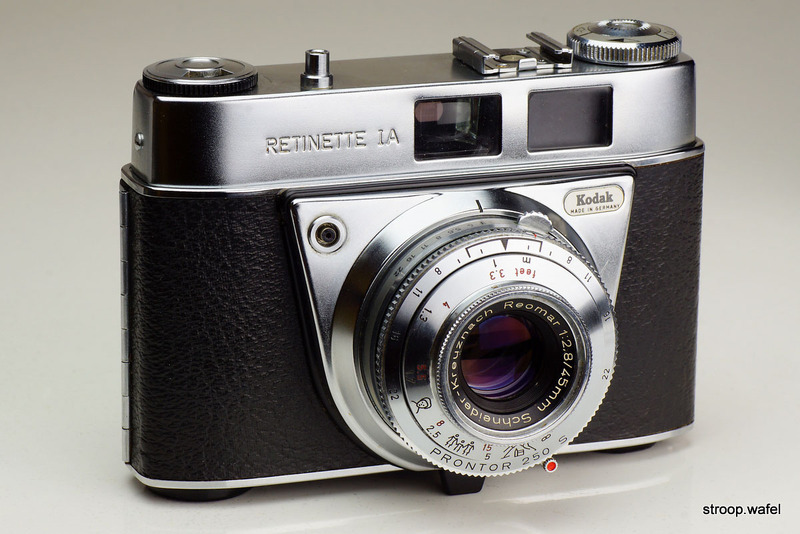 The Retinette IIB was identical to the Retinette II apart from the inclusion of a light meter, the first Retinette to feature one. This certainly has to be the top model of the Retinette series in terms of versatility and specifications. 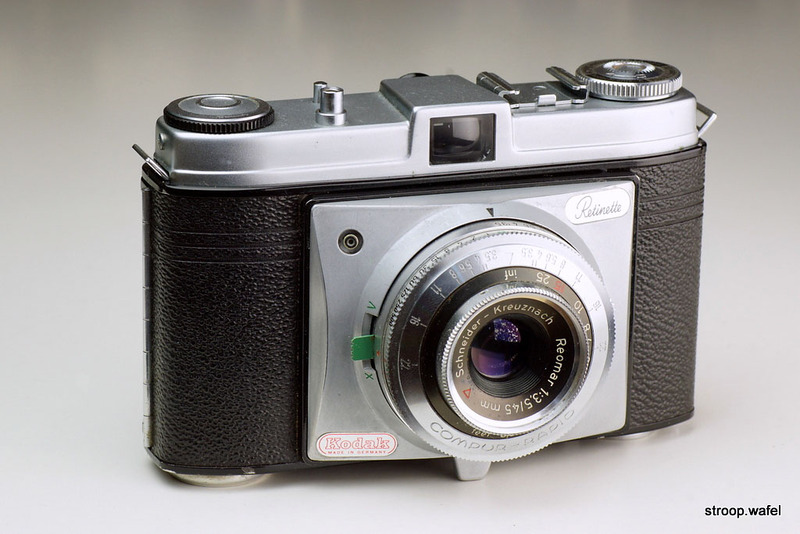 It has the same light value exposure system as the Retinette II, but it was more practical on this model as the light value could be read directly from the light meter. The Retinette IIB, as good as it got in Retinette world? The Retinette IA was rather similar to the Retinette I but with some cosmetic changes. The lens base was now triangular and thus matched the non-folding Retinas from that time. The top housing no longer had the ridge of the earlier models. It came with Vero or Pronto shutters, the Vero missing the time delay. A Retinette IA with Vero shutter, my #001. Look here from some example photographs. The same Retinette IA with vintage flower-style flash unit. Amazingly it came with a still working vintage 15V battery by Mallory. As the company became Duracell in 1978, this battery was still working after at least 34 years. The French version of the Retinette IA with an Angenieux lens 50mm f/2.8 lens. This is a faster lens than the regular model, so this version is more akin the Type 042 below. The Retinette IIA appears a little out of place, in terms of name as well as features. It was rather similar to the IB released around the same time, also featuring a coupled light meter, but it had a lens with sliding depth of field tabs like the Retinette IIB. Like the IB, it had an interesting innovation: the light meter needle was projected in the viewfinder, so one could set the exposure without the need to take ones eye of the viewfinder. 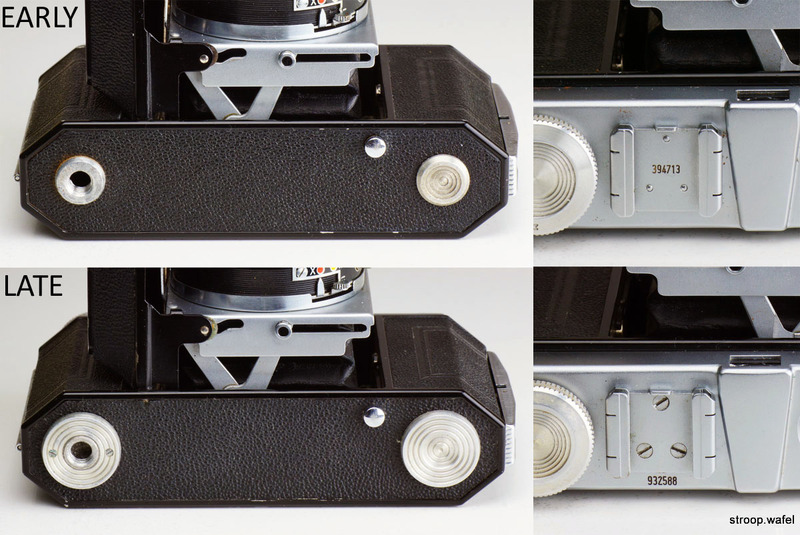 The Prontormat shutter has no speed markings, just a setting for film speed, turning the speed ring would move the needle in the viewfinder until the exposure is right. This was therefore a point and shoot camera. I assume it had a constant shutter speed. The B setting only works with the smallest aperture of f/22. A Retinette IIA, a hybrid between Retinette IB (see next) and IIB. 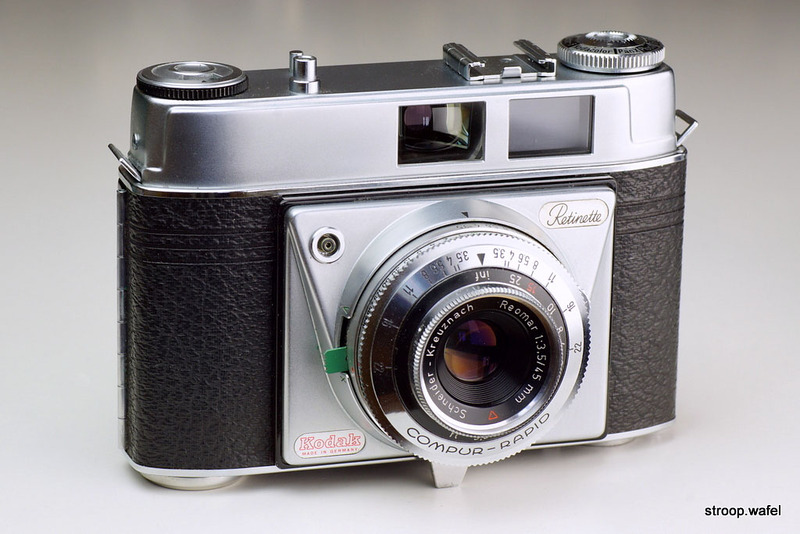 The Retinette IB was, as one would probably guess by now, a Retinette IA with light meter. The lens was rather unusual amongst the Retinettes, a Reomar by Rodenstock. The light meter is coupled to the aperture scale and is projected in the viewfinder. 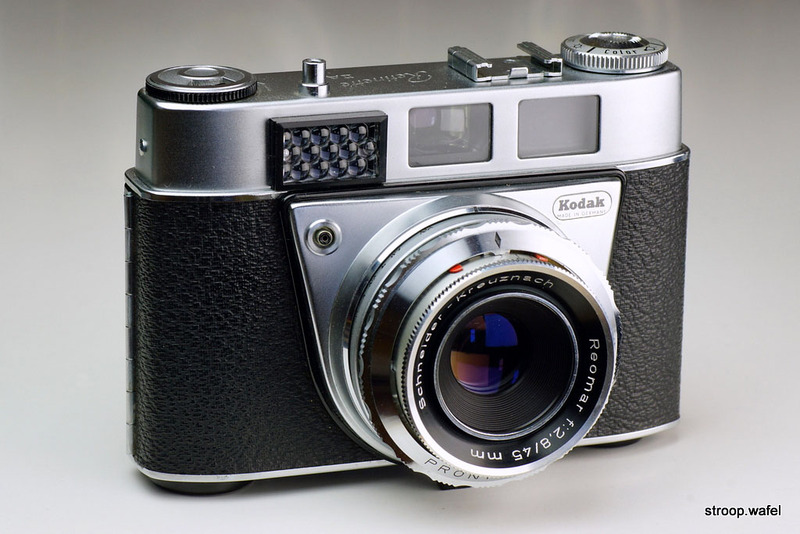 One would select a shutter speed and move the aperture control until the light meter needle would align with a triangle visible in the viewfinder. For unclear reasons, the depth of field marker on the focus distance scale only shows the setting for fully open aperture. This was a pleasant camera to use, the convenience of a light meter but all manual controls easily accessible. 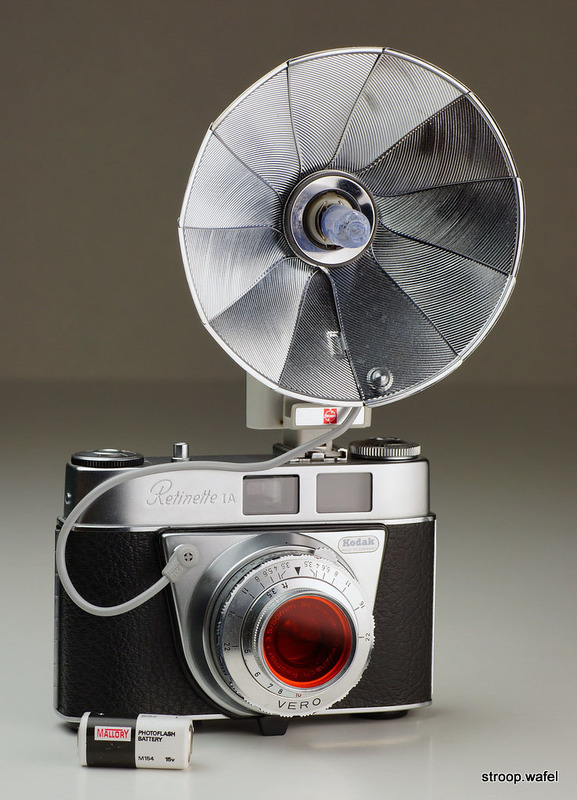 A Retinette IB with coupled light meter, like the Retina Automatics from the same era. 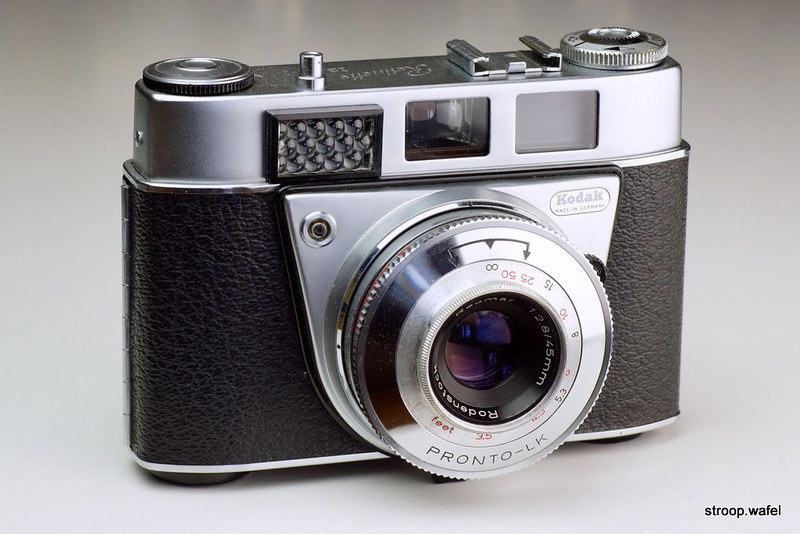 This version of the Retinette IA has a Pronto shutter and is very similar to the Pronto version of the IA type 035, but featuring a faster f/2.8 lens. This model also has different depth of focus markers and includes a zone focussing system marked by dots. The next Retinette IA with faster f/2.8 lens and some changes to the shutter. 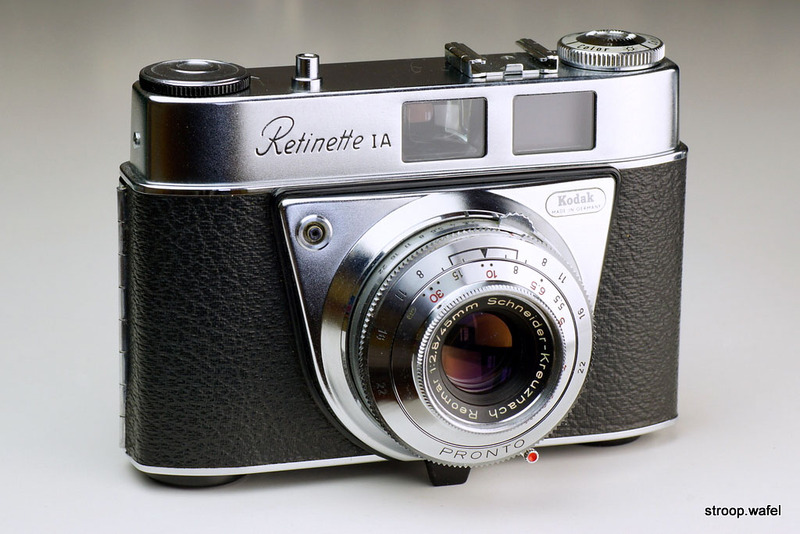 The last incarnation of the Retinette IA, recognisable because of the name written in block letters. It differed from the previous incarnation mostly in the style of the focus ring, which now featured little pictograms to aid zone focussing. It also came with a different shutter, initially a Prontor 250S shutter, later a Prontor 300S. The last Retinette IA, with pictograms and a dual feet/meter focus scale, here with Prontor 250S shutter. The second and last incarnation of the Retinette IB, and the last Retinette altogether. It was very similar to the IB type 037 but featured a larger and more sensitive light meter cell. The lens was, like the earlier IB, a Reomar by Rodenstock. The focus ring is similar to that of the IA type 044 with little pictograms to assist zone focussing. In contrast to the earlier IB, this model features proper depth of field markers. The last Retinette model, the second version of the IB, with large light meter cell marked Gossen.